Model T Ford Forum: How Do I Remove This Retaining Ring? How Do I Remove This Retaining Ring? Model T Ford Forum: Forum 2018: How Do I Remove This Retaining Ring? Look at the 3:00 O'Clock position on the hub. This is the retaining ring mentioned in an earlier thread. What tool(s) can you recommend to remove this ring so that I can press the gear off the shaft? You have to press the gear on a little farther so you can get the retainer out and then press the gear off. You will need a press for sure. you have to press the gear onto the shaft a bit more, then the ring comes off, THEN the gear comes off. 3 press the shaft out of the gear. ECHO - ECHO - ECHO - Hello, anyone out there ??? Bill, the only reason I can surmise to remove that good gear is the axle must be toast. 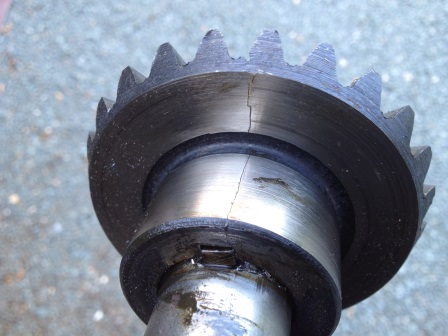 If that is the case, I would cut the axle off an inch or two outboard of the gear, then press the gear onto the axle as others have suggested to get the TWO parts of the circlip out. Then you can press the axle piece out of the gear. The gears can be super tight on the axle shaft. Loading up the pressure on the gear on a full length axle can seriously bow/bend the axle, and if things get slightly out of line, there can be a nasty result. That is why I cut the axle short. Clear instructions in Ford Service, necessity of a Ford owner to keep a copy in the garage. 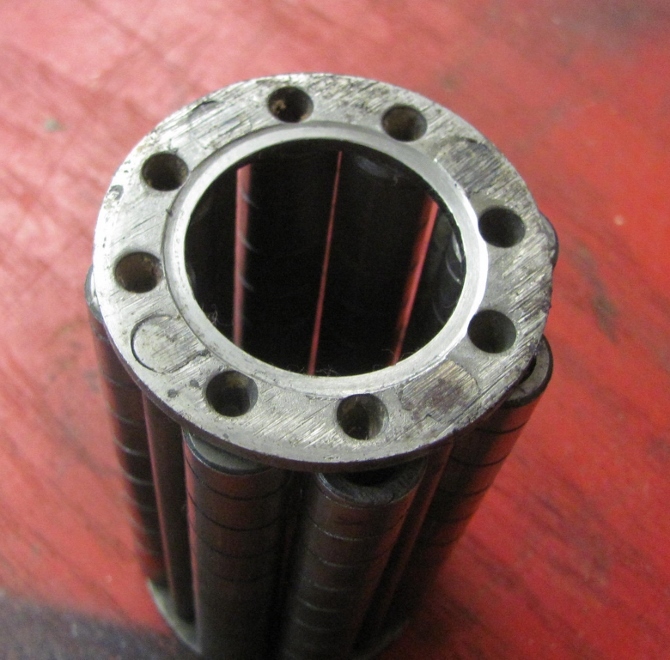 What happens from time to time is the gear is almost impossible to press on a new shaft. The reason being the new shafts are turned within a OD range of a variance of a very few thousandths. 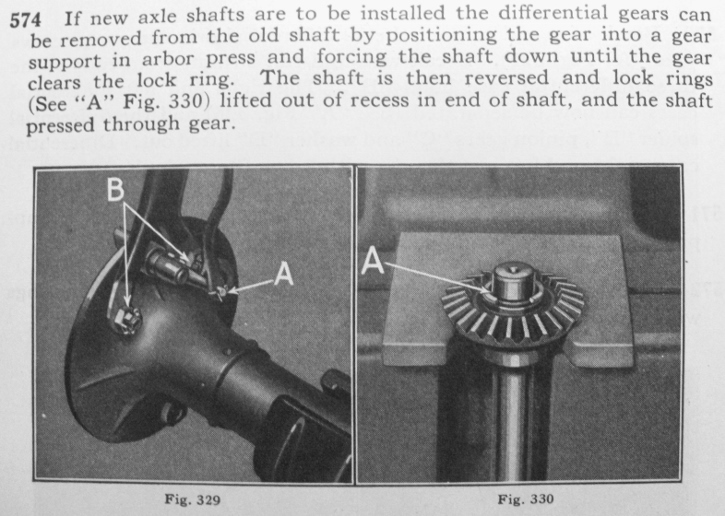 Ford had an acceptable range for the axle and gears and most of the time the gears pressed on OK but not always. I happened to buy a new axle and upon trying to install my gear it wouldn't go on.. I returned the axle to the vendor and he sent me a new one that fell in the range for my gear ID. He told me it does happen infrequently. 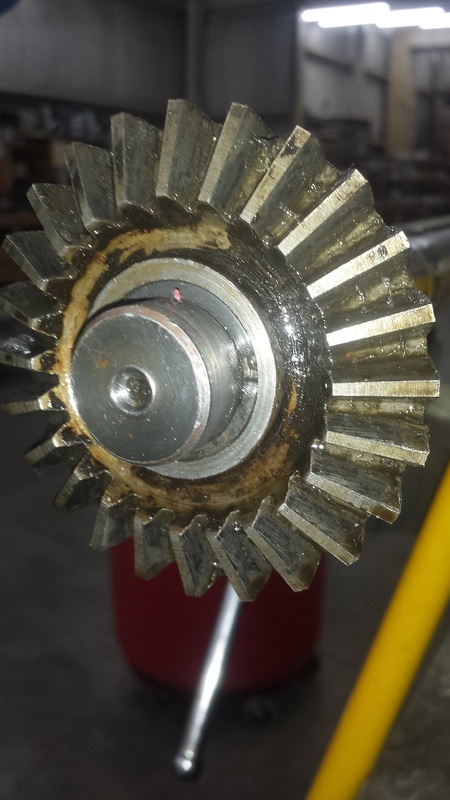 This is why it's sometimes tough to press off the gear from an old axle. I have a feeling Ford experienced the same thing at the factory. They had stacks of axles and boxes of gears to assemble and I suspect there was a small pile of rejects because of this happening.